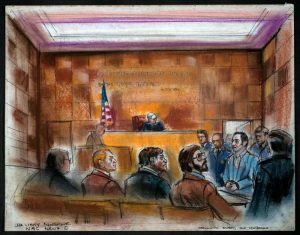 Students returning to campus this fall may wonder what happened to the intriguing courtroom sketches that were on display in the Georgetown Law Library. Their creator, Ida Libby Dengrove, drew some of the most memorable trials of the late twentieth century. The Dengrove exhibit was provided on loan from the University of Virginia Law Library, and its time with us has come to an end. However, you can still view the collection on the UVA Law Library website and learn more about the events the sketches depict. Now on display in the the Williams third floor atrium are landscape photos taken by library staff. We hope you enjoy them, and please let us know if you have any feedback of suggestions for future exhibits. This entry was posted in Library Exhibits on August 14, 2017 by Matt Zimmerman. The library has a number of scholar studies that are normally reserved for use by visiting scholars or others who need a small office. 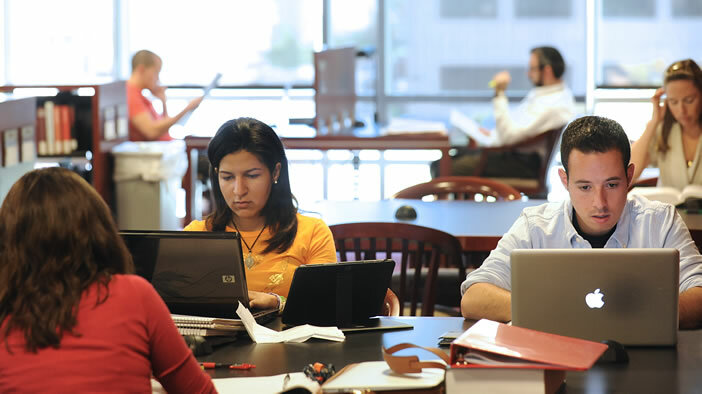 From December 1-19, unassigned scholar studies are available to Georgetown Law students studying for exams in addition to our usual 21 group study rooms. Scholar studies are smaller spaces that accommodate two students, maximum. These studies require only one NetID and may be reserved up to 5 hours a day. Follow this link to reserve a scholar study. Information about the scholar studies, while they are available, is on the group study room reservation page. We hope you find this helpful! Best of luck on exams. Please let us know if you have any comments or suggestions. This entry was posted in News for Students on November 30, 2015 by Matt Zimmerman. 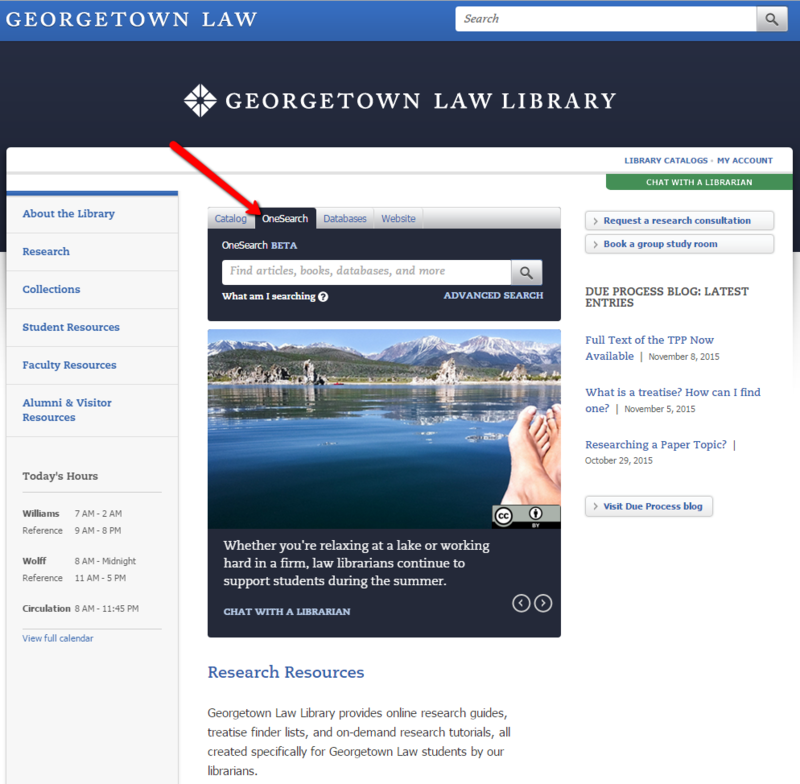 The Georgetown Law Library is pleased to introduce OneSearch. OneSearch is a tool for discovering articles, books, databases, and other resources from many different places. It uses a massive search index that dives deep into our catalog, subscription databases, and other Georgetown libraries. OneSearch also has built-in tools to help you navigate this vast array of resources. “Best bets” and database recommendations steer you to popular resources. Facets let you refine your search. And OneSearch has numerous features to improve usability, such as auto-completion when you are entering search terms, spelling correction, and a responsive design for mobile device compatibility. For now OneSearch is in “beta” release. All its features are in place, and we have gotten it as ready for you as we can. Now we need you to use it and let us know how it goes. 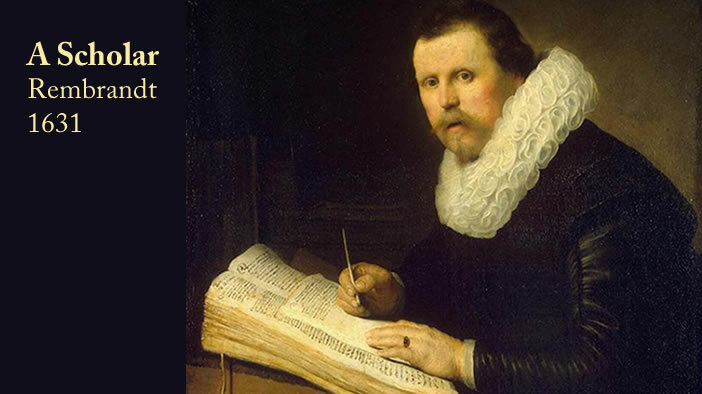 Please use the feedback link in OneSearch to report any issues, send an e-mail to libraryers@law.georgetown.edu, or report your comments to any librarian. Also, stay tuned to Due Process and your student e-mail account for opportunities to participate in user testing of OneSearch and other library systems. This entry was posted in Database News, Library Catalog, News for Faculty, News for Students, Technology News on November 9, 2015 by Matt Zimmerman. UPDATE: JSTOR should be working again. Please let us know if you encounter further problems. The JSTOR database platform is having technical trouble. Since yesterday, access to content has been intermittent at best. JSTOR is working on the issue. Stay tuned for further updates. In the meantime, please contact the reference desk if you would like help finding what you need from other sources. This entry was posted in Database News on October 14, 2015 by Matt Zimmerman. GULLiver, the library catalog, may be unavailable some time between 11 p.m. and midnight tonight, October 7. Information Systems Technology (IST) is doing network upgrades. 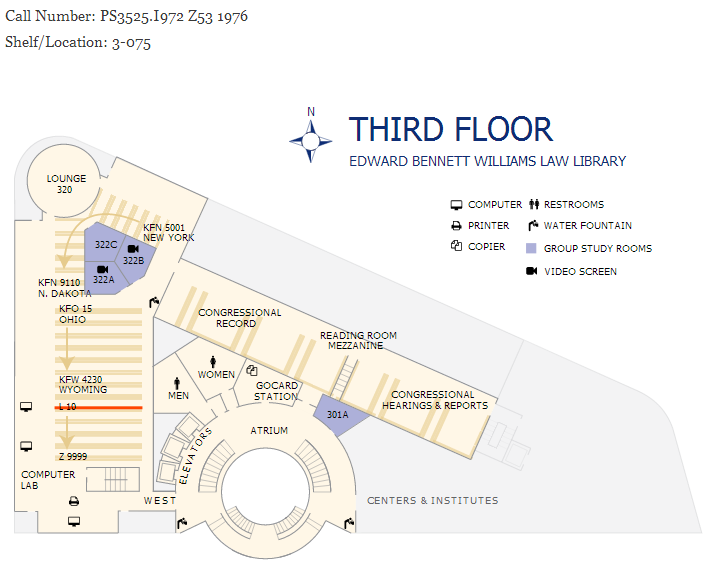 The rest of the Georgetown Law Library website will be unaffected. Please contact the IST Service Desk if you have any problems after midnight. 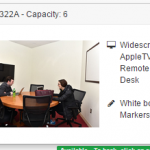 This entry was posted in Library Catalog on October 7, 2015 by Matt Zimmerman. GULLiver, the library catalog, may be unavailable for about 30 minutes to two hours some time between 8 a.m. and 2 p.m. on Sunday, August 16. Information Systems Technology (IST) is doing network upgrades. The rest of the Georgetown Law Library website will be unaffected. This entry was posted in Library Catalog, News for Alumni, News for Faculty, News for Students, Technology News on August 15, 2015 by Matt Zimmerman. It’s got a totally new interface for comparing, selecting, and reserving rooms. Room information is enhanced and easier to access. It’s a lot more usable on smartphones and other mobile devices. One important limitation is that the new system will not automatically notify everyone in your group. So if you make a reservation, please remember to forward the confirmation e-mail. For reservation dates prior to March 30, please continue to use the old system. We hope you like this upgrade. Please fill out our suggestion form if you have any feedback. Check out this two-minute video to quickly learn how to use the new reservation system. This entry was posted in Library News, News for Students on March 20, 2015 by Matt Zimmerman. Can’t Find It in the Library? Map It! This is an all-too familiar scenario for Georgetown Law students who have gone hunting for books in remote corners of our two library locations. The library has over half a million print volumes spread out over 100,000 feet of shelves across seven floors and two buildings. 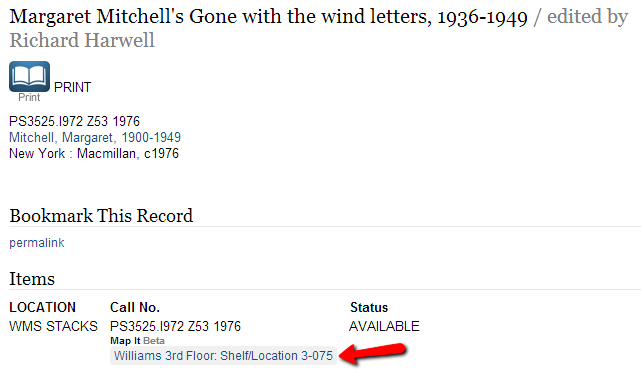 Locating a book by its call number can be a challenge for even the most dedicated library dweller. 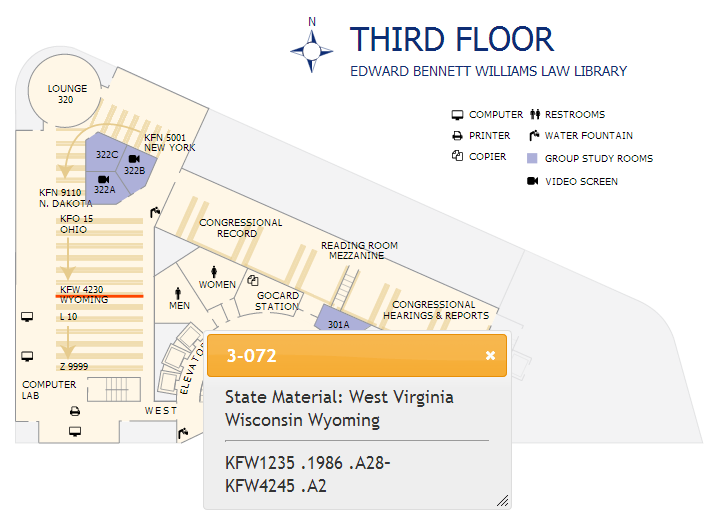 Our new Map It service, however, allows you to pinpoint a book’s location straight from the catalog. Look for the Map It Beta link below the call number when you’re viewing an item. The gray button will show the precise location for the item. Click it to highlight the shelf on the map for that floor. Finally, please note that we’re beta testing the Map It service. We think it’s useful, which is why we’re sharing it now. But there may be some kinks to work out. Please let us know if you run into any problems or if you have any questions. There’s a feedback form below every map, and you can also submit comments via our online suggestion box. 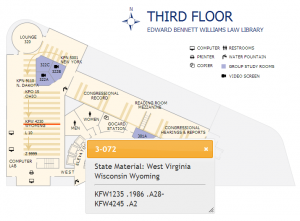 This entry was posted in Library Catalog, Library News, News for Students, Technology News and tagged maps on August 6, 2014 by Matt Zimmerman. The Georgetown Law Library reading and exam period is in effect Monday April 21 through Wednesday May 13. During this time, only Georgetown University students, faculty, staff, alumni, members of the Friends of the Library program, and public patron card holders are admitted. The Williams Library is now open 24 hours a day through the end of exams. The Wolff Library will also be open around the clock starting on April 28 through the end of exams. The complete schedule for both libraries as well as circulation and reference services may be found on our Library Hours Calendar. This entry was posted in Library News, Library Policies, News for Students and tagged exams, hours on April 24, 2014 by Matt Zimmerman.